Ours was busy, like always, but also fun! that I will share soon. While shopping this weekend, I came across this two tier basket. I have been wanting one for a while now to use in my master bathroom. this one at Kirklands for $14.99. The color is bronze and very pretty in person. They also had one with three tiers, but it was a little too large for my space. 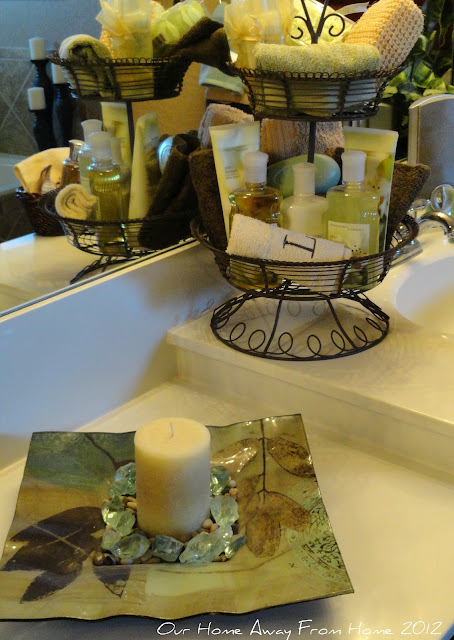 I already had all the soaps and sponges, so it took five minutes to put it together. 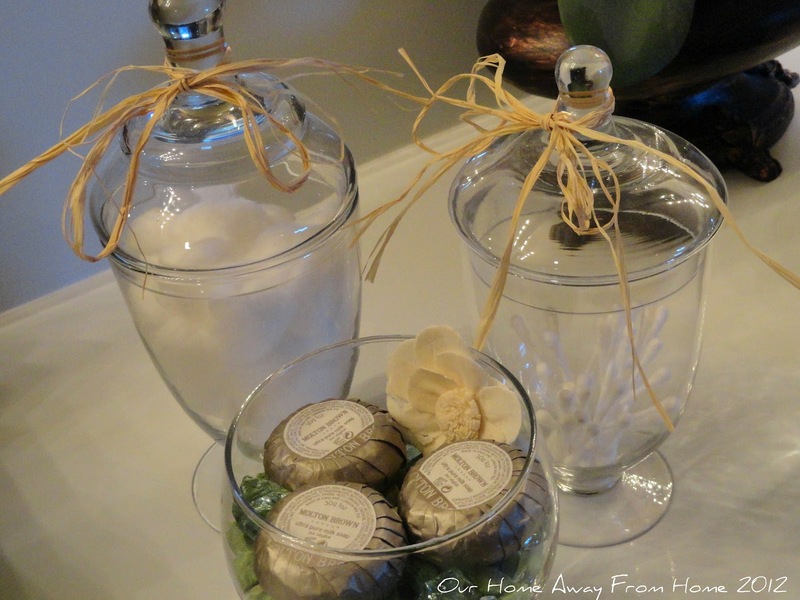 And, remember the jars I had found at GW and had used for the cloches in the kitchen? I also found a wonderful "treasure" for the bathtub area! Wow, this is so pretty! It looks so fresh and ready for Spring! 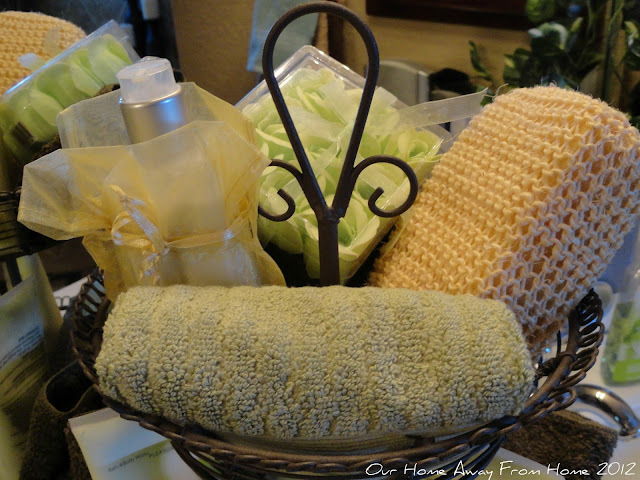 Your bath products look perfect in your new tiered basket! 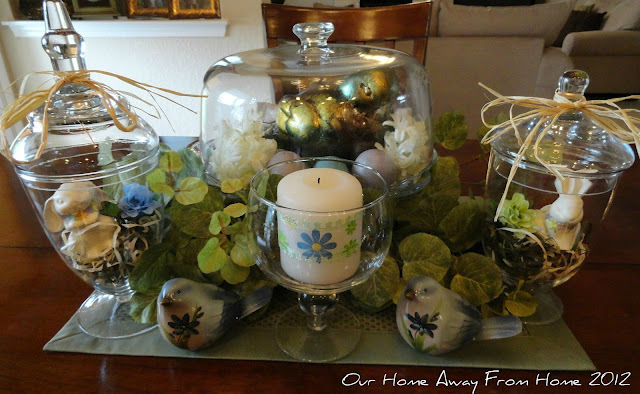 You always make such pretty vignettes! Ohhhhhhh! I adore your basket! You did a great job accessorizing it. I noticed your stereo on the cabinet also, I HAVE to have music in the bathroom. Funny isn't it? I always consider hiding it or moving it but turning the music on is the first thing I do in the am! I love the tiered baskets! You accessorized it perfectly & it looks so pretty! Great buys!! I especially love the tiered one form Kirkland's!! First off, thanks so much for stopping in for a visit to my blog and leaving the lovely comment on the frames. I'm a fairly new blogger (since January) and get so excited when I get comments, so thank you for that! 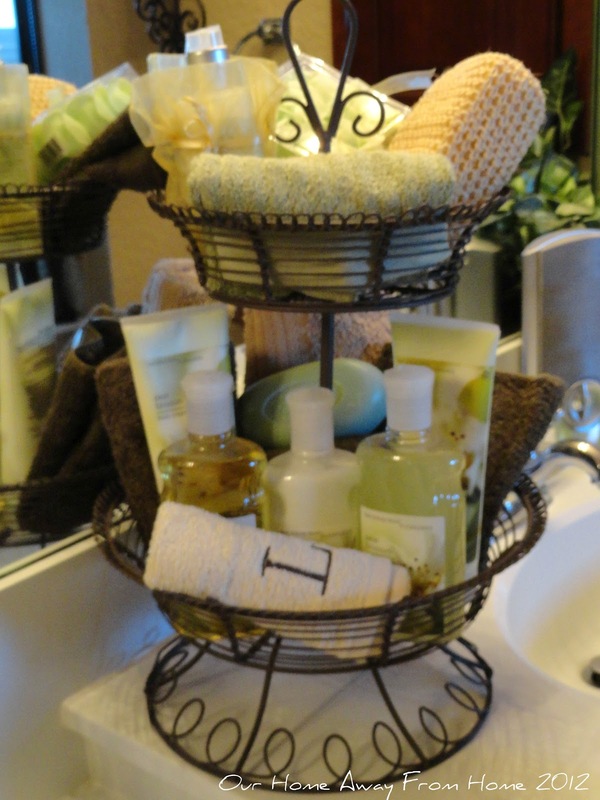 Love the tiered basket, they are so pretty and practical at the same time. 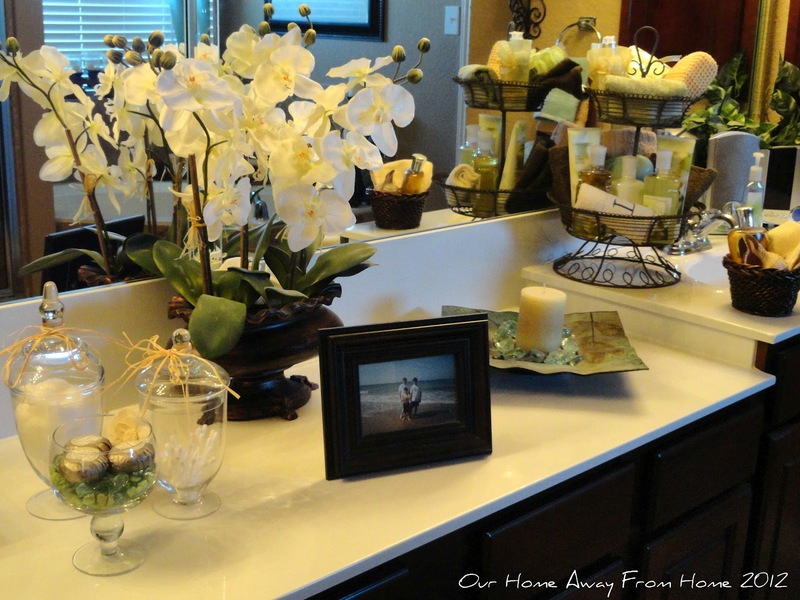 I also love the color scheme, very fresh and clean for a bathroom. Now I have to go so I can explore your blog! I have joined as a follower so I will check in often. I just saw one of these today and I thought, what would I do with this. Well I certainly know what I would do with it now. Looks so pretty. Thanks for sharing with the newbie party. I want to go to the GW that you shop at! Everything looks great. I love the tiered basket and your bathroom looks lovely. 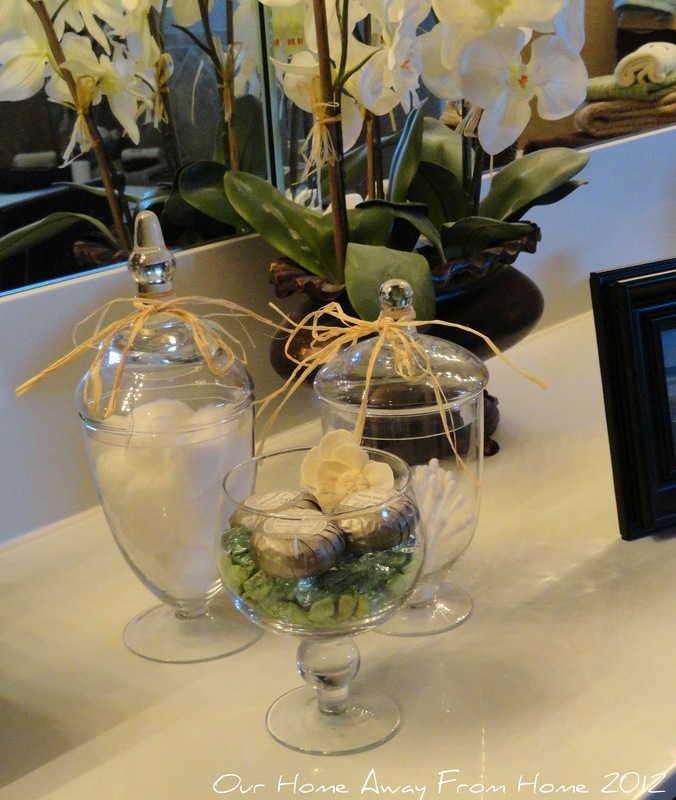 Two tiered baskets are great to use to pretty up an area. I really like how you used yours in the bathroom. 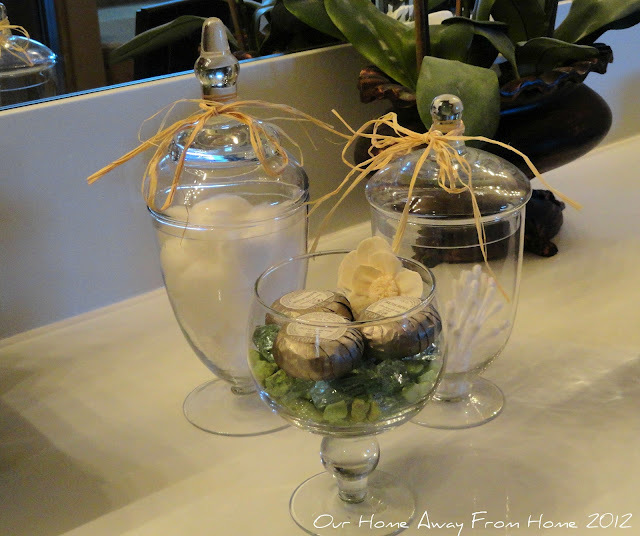 The apothecary jars are perfect too. I love using pretties for holding all of our everyday stuff. I would love for you to come share this at my linky party, Cowgirl Up! going on right now! 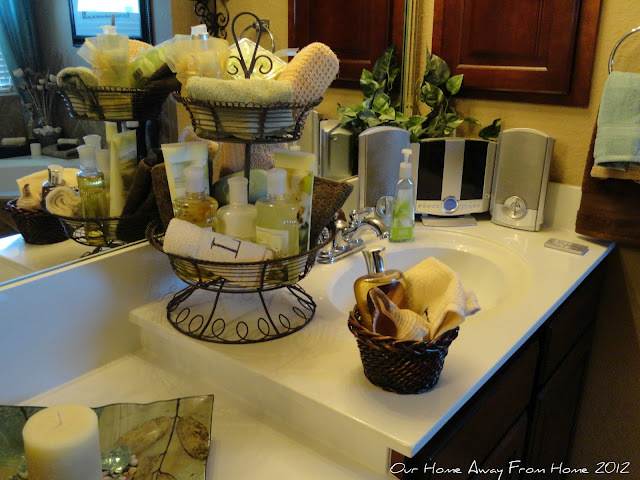 Your bathroom looks lovely, Maria Elena! I really like what you did with the tiered basket. I just love Kirklands! What a great idea! 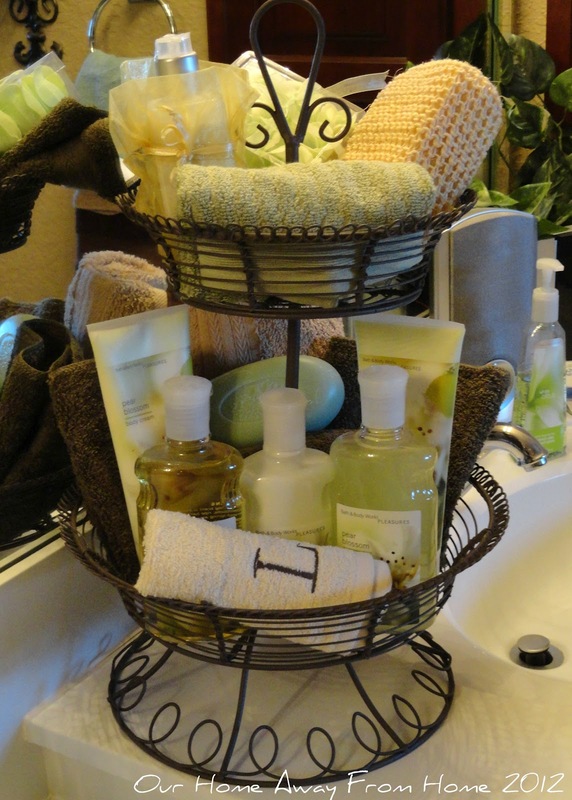 Love the tiered basket. Thanks for sharing it here!